A shooting game based on The Legend of Zelda: Twilight Princess and packaged with the Wii Zapper. Link must gain a high score by shooting targets or enemies within a time limit. At the end of each stage, you are awarded with a medal based on your score. In Target Shooting, Link must shoot the targets placed around a location, with more points for hitting the center of the bullseye. 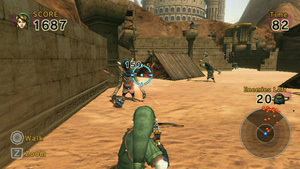 In Defender, Link stands still, shooting enemies as they advance. In Ranger, you control Link as he sneaks around, taking out enemy targets.